Having finished up the Court cards and the Major Arcana, I figured I'd at least start on the 'pip' cards, or numbered cards. And what better place to start than the Aces? The Aces are perhaps the embodiment of the suits- unlike the Court cards, they represent the essence of their respective suits and elements. Instead of actuality, we see potential- these are in many ways the 'void' cards, representing potential which can be used in any way we choose. To see the Aces in a reading can indicate a starting point- something coming into one's life, perhaps in the form of new opportunities or new and unrealized potential. It's up to us to take advantage of that potential, and to make use of it in our lives. There is a system of correspondence, where the the number cards are 'governed' by the Major Arcana cards that match their numbers. It's arguable whether the Aces should be governed by the Fool, numbered 0, or the Magician, numbered 1. For discussion purposes here, we'll assign the Aces to the Magician. Interestingly, the Magician is often portrayed as having these objects on his table, altar or whatever he's standing next to or working with. And the Magician can shed some light on the nature of the Aces. The symbols of the Aces, and by extension the four suits of the deck, are laid out for the Magician's use. The Aces represent, again, potential and undeveloped or unused-as-of-yet resources. 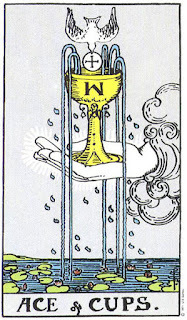 The Magician can make use of them, turn that potential into actuality, as this is the nature of the Magician- to manipulate (in a positive sense) the world around him to accomplish his purposes. A closer look at the Aces themselves can help to clarify this. 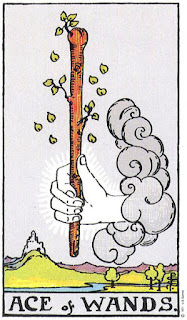 First, we have the Ace of Wands- a hand (for some reason coming out of a cloud) offers us a budding wand. In the background, we see a castle on a hill, looking like a pretty good location both in terms of land and tactical value- these builders have obviously taken the 'high ground', putting the castle in a good defensive position. In terms of the Ace, remember that it's tied to Fire- that is, will and the drive to make ambitions real. This castle, in its defensible position, tells us of how determination and will can create these things, and allow us to defend them. Again, the Ace here tells of a new direction, backed up by determination and willpower. What direction that willpower and determination take remains up to us- it can be a message to follow that idea or objective we have, and bring it to fruition. In its more negative sense, the Ace can tell of one of two things, both of which lead to the same result- either we lack the focus for our energy, resulting in a lot of smoke, but no fire, as our energy is expended chasing first one task, then the other. The second interpretation is that though there's a purpose and direction, we ourselves lack the follow-through to make that goal a reality. Instead of having will but no clear focus, we have a clear focus and no will to follow through. Here we see a sword with a crown at its point, and the hand appears over a mountain range. 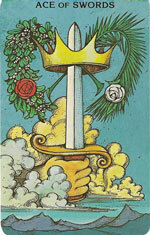 The focus of the Ace of Swords is the Air element, and with it, the intellect, reason, ideas and thought. Here the potential of the Aces takes on the sense not of physical change, but of an internal one- new ideas may come to us, or new inspiration. We find ourselves in an environment conducive to creativity and new learning. It could even be developing a new career path- becoming a student again, and the potential to put that learning to use. Perhaps the mountains are in the background to remind us that the mind, when properly applied, can level mountains. 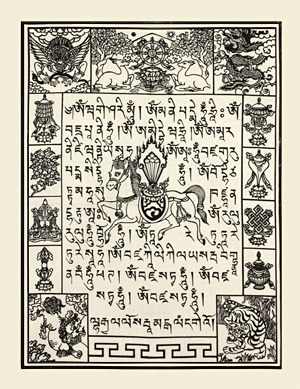 The crown here also shows that through reason and logic, we can in fact rule our world. A part of the message here is understanding- understanding is the key to overcoming, or working with. In this Ace's more negative sense, it indicates a million different ideas- either our thoughts aren't clear, and we're left puzzled and confused, or we simply don't understand. Instead of acting on a new idea, we might find here that we don't have that clarity of thought, or haven't thought whatever new direction we're contemplating all the way through- here is the danger of unforeseen complications, things we didn't prepare for or see coming. Here we see a descending dove, such as was seen in the Bible when Jesus was baptized by John the Baptist. The dove is holding a host, which is the wafer used in Christian communion services. This represents an aspect of the Ace, which is what we could call blessings- good fortune, and the happiness and strength of heart to follow our dreams. Here also is hope for the future, and guidance for how that future should unfold, seemingly like a light from above. Sometimes in cartoons we'll see a cartoon character standing there looking up raptly, while a shaft of light shines down on them, and we hear a "heavenly choir" behind them. This is, in some ways, the message of this card- a revelation, an insight, and a joyful one. Like all the Aces, this one represents potential, so what we do with this revelation and new insight depends largely on us ourselves. The hands shown on the Aces may offer, but they cannot force us to take what's offered. Finally, we have the Ace of Pentacles, and here we see a hint in the background. Again, we see the hand offering a Pentacle, and in the background, an entrance to a garden, and flowers blooming along the way to that garden. It's not a coincidence that this suit is often called Coins. The Ace here deals with the potential of the physical world, which is much like a garden. It represents the potential to invest, and like a garden, to increase beyond what you began with- from seeds to plants. And as always, we see the hand offering, but the decision to accept, and also how to use this resource, remains with us. 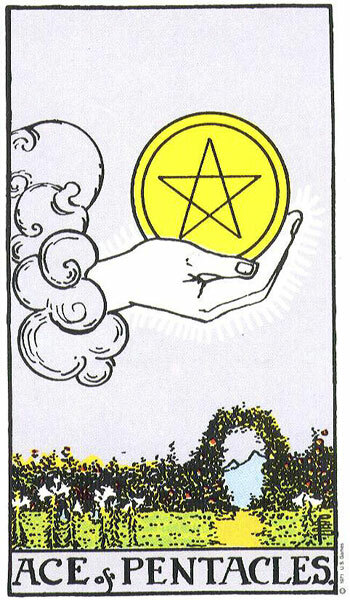 Whereas the other Aces tend to point to new potentials and ideas, the Ace of Pentacles is more of a practical change, perhaps a return on an investment, or even a new job opportunity. In any sense, the Ace represents a new direction for our resources, and again, it's up to us to put that potential to use. In its more negative sense, perhaps this is the most obvious negative interpretation- either hoarding or squandering- either way, not using this resource to its fullest potential. 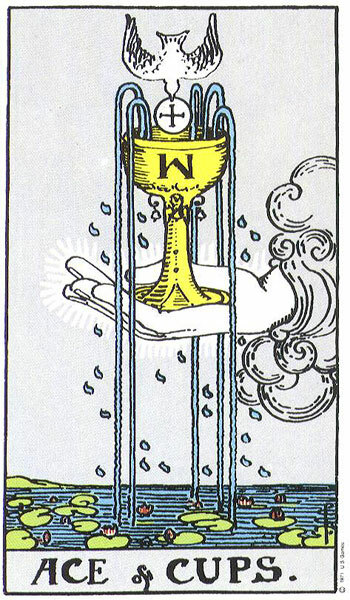 So overall, the Aces represent the earliest stages of development- here we have potential- we find that new opportunities arise, and new developments can occur- at this point, it's up to us to guide and direct how these potentials unfold, and which direction we apply these new resources.